One consistent lesson I have learned working on a wide variety of motion design and interactive digital projects is; don’t let the excitement of the new tech entice the team into overloading this digital space with too much information. No matter whether it’s an art director or a game designer, we all have a tendency to stir too many ingredients into mix. The more experienced communicators understand it’s what we remove from the recipe that brings out the most important flavors. This is a natural tendency, inherent while creatively striding for powerful and far reaching engagement, is not how effective and long lasting relationships are formed with the consumer. The consumer, which includes us creators as well can only digest and process so much while drinking from the fire hose of zeros and ones we’re ingesting on a daily basis. 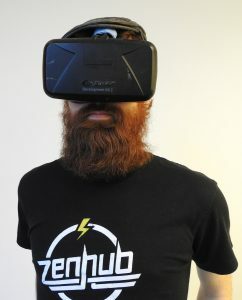 The rapid gains being made in the virtual reality market only act to amplify the need for thoughtfully managed and well designed digital space. How can we leverage VR Tech? I began my exploration in the VR realm back in 2005 while earning my MA at the University of Denver. Much of the research that has led to our current day renaissance of VR immersion and digital scanning of the human nervous system was just opening its petals getting ready to bloom. I was amazed how much of the research at various universities went from being nothing more than theory to a confirmation of delivery within just 4 years. We truly are learning how to meld organic mind with machine on multiple fronts, presenting both amazing opportunity and the inherent risks present in any endeavor of this magnitude. A valuable golden nugget of enlightenment gleaned from my research was that we humans have a surprisingly filtered and narrow bandwidth when it comes to our sensory experience of the world. Our optical-cognitive focus is very targeted and we miss more than we absorb at any given moment. Many other streams of information envelope us, influence us on a subconscious level, yet go largely unnoticed. If you think many people out there aren’t making a living tapping into your unconscious on a daily basis, guess again. Another facet to my research is working with the disabled community at a wonderful program in Winter Park Colorado called, the National Center Sports Center for the Disabled, NSCD. http://nscd.org/about-nscd-adaptive-sports/ In many neuroscience research explorations, studying individuals who have faced some form of damage such as a brain lesion or some other facet of their nervous system being altered by an accident provides clues as to how we humans take in the world. The brave individuals facing a wide variety of challenges such as cerebral palsy, blindness, deafness and down syndrome to name a few come to Winter Park to use their other strengths to find a way down the mountain. They are custom fitted with ski, snow board and other sport augmenting tools to help them overcome the physical and mental setbacks that have kept them from other more ordinary activities. As a volunteer instructor I’ve often been humbled and amazed at what a human can achieve when they really set their mind to it. The spirit of empowering and enabling the “disabled” inspired me to develop a proposed sit ski game training system factoring in the multitude of physiological factors. The end goal of this system, to provide a powerful and safe training tool for everyone from sit ski racers to the paraplegic 11 year old in Kansas who’s never even seen a mountain in her life. This tool will also provide an effective, controlled and immersive way to expose a much larger population to the wonderful therapeutic benefits gained by both the disabled individual as well as their heroic, often unrecognized caretakers. One of the many opportunities provided by an immersive sit ski training system is how various disabled athletes respond to specific kinesthetic, proprioceptive, spatial, auditory and even olfactory learning cues. The controlled and targeted nature of the sensory input beckons in-depth research into multiple sensory as well as cognitive feedback sources the immersed individual is interacting with. This is UI/UX on a whole new level and arguably will encompass a much deeper understanding of human-computer interaction. What kind of generated visual, auditory and physical feedback does each individual need to enjoy the most gains effectively? What feedback is distracting, upsetting and/or confusing for different individuals? How do we identify the difference quickly and have a system in place where we can adjust this environment on the fly before we lose our explorer’s desire to remain in this VR space? 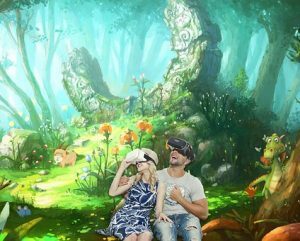 Today’s technology provides such great advancements as, fMRI, Oculus Rift and Hololens combined with affordable powerful computer processing renders this unique moment in history as the perfect time to explore immersive game training on a much higher level. I will be expanding on my proposed system and the research behind it at great length in the months ahead.